The weight and support requirements for early machine-guns lead to the realisation that these were defensive weapons, that could best be employed from fixed positions, where the supply of ammunition could be maintained. 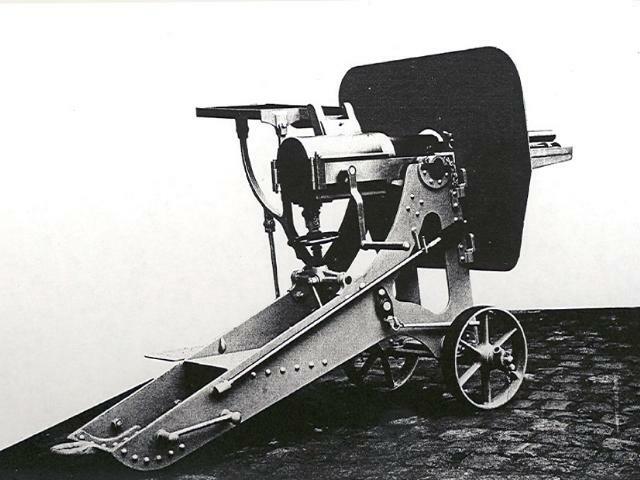 Hotchkiss developed a Fortress Defence gun in 1874, which fired a large explosive shell to ranges of 5000 to 6000m, but this was made obsolete by improvements in siege weapons. Instead, a variant of the Revolving Cannon was developed for defending the walls of forts against massed assaults. The Flank Defence Gun was specifically designed to protect the fort walls, and could be brought into action rapidly in any state of visibility. This is an illustration of the French flanking gun (Défence de Fossé) model 1879, and is based on a drawing from Col. Truttmann's book La Barrière de Fer, and a photograph in Lieut. Very's book on the Hotchkiss gun [H1]. The great power and accuracy of siege artillery in the 1880s lead to changes in the design of permanent fortifications, particularly in French forts built around Paris following the Franco-Prussian war. These changes included a reduction in the width of the ditch which exposed them to attacks by direct assault which the old fashioned bastioned fronts with wide deep ditches and masonry scarps would have impeded. 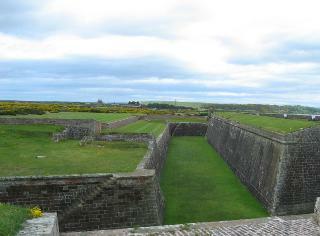 To counter an assault across a broad front, it was necessary to provide a flanking battery that could sweep the whole length of the front of the fort walls and also the whole width of the ditch. In addition, the line of fire must be sufficiently high to prevent the attacking force from masking the embrasures. Against an assault, flanking by ordinary types of guns was unsatisfactory, since they act only against a certain determined point and required a decided interval between discharges. Machine-guns of this period could not sweep every part of a ditch unless they were given a double movement of dispersion, laterally and vertically, which required the use of complicated mechanisms which had to be maintained in damp casements where the guns had to be permanently mounted. 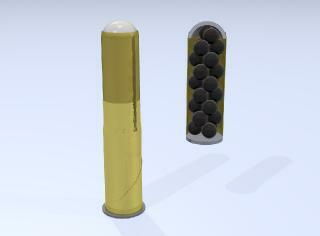 If a round of case-shot is fired from a rifled gun, the canister containing the balls would tend to grip the rifling and emerge from the muzzle with a spin. The canister then breaks up, and the balls are dispersed in a cone, whose angle depends upon the pitch of the rifling and consequently the rate of spin. 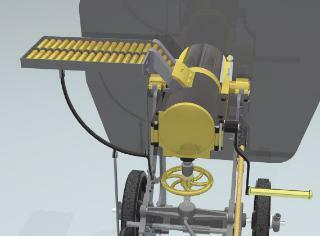 In the Hotchkiss Flank Defence Gun, each of the five barrels has a different rifling pitch, and thus each successive discharge produces a wider or narrower cone of bullets. To cover a ditch 300m in length and 12m wide, a Flanking Gun would be mounted 3m above the ditch, and would give a dangerous zone along the whole length of the ditch from 12m to 300m. 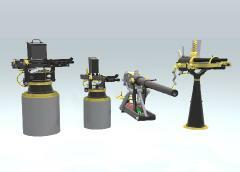 The Flanking revolving cannon is set up and locked in position. The arm is then constantly ready for service. It requires no sighting, and has no lateral motion, so that smoke, darkness, or excitement do not interfere with its work. In a surprise attack during day or night it is only necessary to turn the crank, and the gun will discharge 60 to 80 canister shots per minute, consisting of 1,500 to 2,000 balls of sufficient weight to destroy scaling ladders and such like. The gun has a long inclined trough which carries 40 cartridges, these roll into the gun when the crank is turned, whilst a man continues to feed ammunition into the trough as fast as it is consumed. Barrel No. 5 Length of pitch = 6.70m (long range, narrow spread) [H1]. If you have photos of any Hotchkiss gun, particularly the Flank Defence gun, please send them to me so that I can include them in my gallery. See my contact details.